The Chief Executive Officer of the now dead crypto firm GAW Miners, Homero Joshua Garza is being sent to prison for 21 months on charges of defrauding investors. The verdict was passed by the Hartford federal court after he pleaded guilty to a charge of wire fraud done when creating as well as the selling the crypto called PayCoin. PayCoin was basically a scam coin. The original sentence was for 20 years, however, that was cut down to 21 months starting January 4, 2019 till 2021. Additionally, he will also serve another 3 years of supervised release, which includes 6 months’ house arrest. The Japanese financial behemoth SBI Holdings is going to be launching a new app for iOS and Android users. This app will be a payments platform that will be powered by Ripple’s DLT (distributed ledger technology). The app, called MoneyTap, has been developed by SBI Ripple Asia, a joint venture between SBI Holdings and Ripple. The Chief Executive Officer of SBI Ripple Asia, Takashi Okita announced this new product and revealed the website on Wednesday. While, the exact launch date of this app is not clear, MoneyTap’s website indicates that it could hit the markets sometime in autumn this year. IBM announced that it had joined the Yellow Pages equivalent for Blockchain project. This is a registry initiative for decentralized cross-blockchains and is called Unbounded Registry. This initiative will be led by HACERA, a blockchain startup. Unbounded Registry is being designed to provide a way to register, find join or even transact with a range of blockchain solutions. The Registry is also designed in such a way that allows DLTs to interoperate with each other. This project is expected to address some of the biggest issues in the industry, such as the reserved naming for Blockchain powered projects, cataloging domain-specific services as well as functions and the discoverability of networks and apps related to Blockchain. Trading volumes have gone up by $2.66 billion to $14.52 billion. 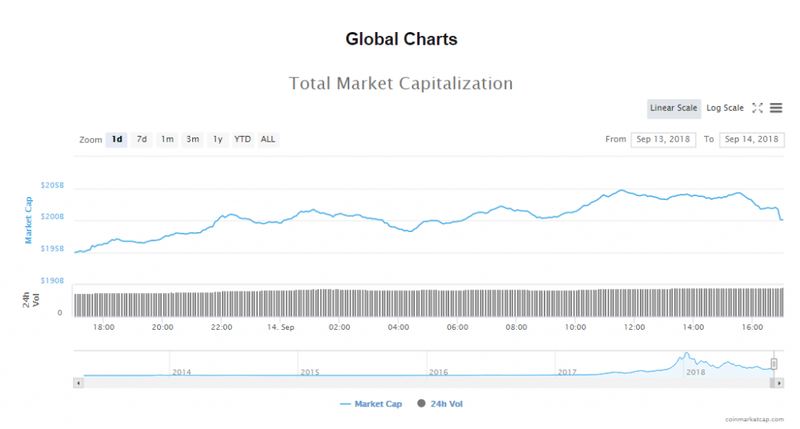 The capitalization of the crypto market is $199.26 billion, rising $4.84 billion since yesterday. Bitcoin’s current token price is $6495.77, up 1.30% since yesterday. Bitcoin’s market value is $111.78 billion and volumes are currently $4.38 billion. Ethereum’s current token price is $207.19, gaining another 9.88% in the last 24 hours. Ether’s token value is $21.17 billion with trade volumes of $2.53 billion. 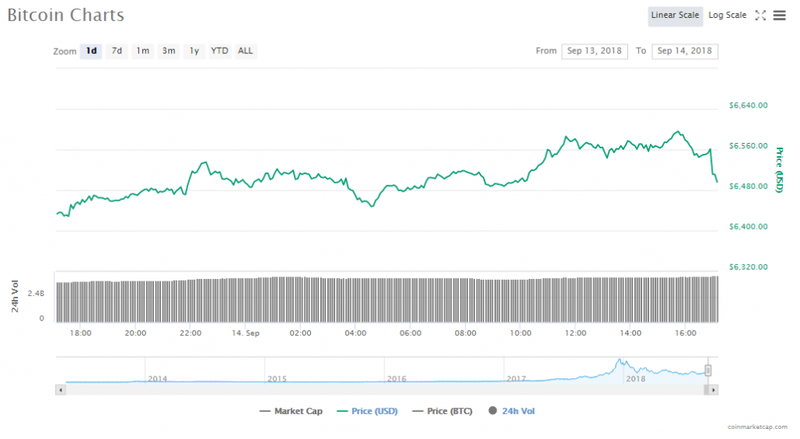 Since yesterday, the crypto market has seen a huge jump, with the price of Ethereum going up as much as 15% in trading. However, at this time, the gains have slowed, though the market still remains in the green. 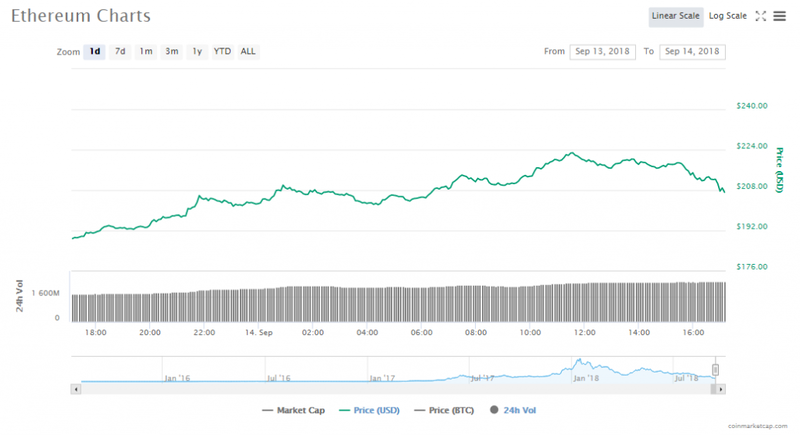 The only crypto who’s price has dropped is Stellar, which has lost 1.01% in the last 24 hour. Ethereum is the biggest gainer, still showing a 9.88% increase since yesterday. Bitcoin is at $6411.92, rising 1.79%. The digital asset’s capitalization is $110.75 billion. Ethereum is at $207.19%, rising 9.88%. The digital asset’s capitalization is $21.17 billion. Ripple is at $0.277396, rising 2.31%. The digital asset’s capitalization is $11.01 billion. Bitcoin Cash is at $451.36, rising 3.04%. The digital asset’s capitalization is $7.82 billion. EOS is at $5.22, rising 4.62%. The digital asset’s capitalization is $4.73 billion. Stellar is at $0.202725, dropping 1.01%. The digital asset’s capitalization is $3.80 billion. Litecoin is at $54.04, rising 2%. The digital asset’s capitalization is $3.14 billion. Tether is at $1, rising 0.17%. The digital asset’s capitalization is $2.76 billion. Monero is at $110.59, rising 1.19%. The digital asset’s capitalization is $1.81 billion. Cardano is at $0.067068, gaining 0.06%. The digital asset’s capitalization is $1.73 billion. India might just be the next country to finally embrace the world of cryptocurrency. According to the official report, the country’s government is looking at making this a reality, but there is catch. It will only be made possible through tough terms and conditions attached. The US Securities and Exchange Commission (SEC) is reportedly going to review its decision of rejecting 9 Bitcoin based Exchange Traded Fund (ETF) application. The SEC had rejected the applications on Wednesday this week, a total of 9 applications for BTC ETFs that had been filed by 3 separate companies. EOS has once again set a new all-time high, and it is expected to hold yet another record this year. It turns out that it is finally recovering from this weekend’s devastation, as incredibly shown by its positive momentum. This contributed to EOS price hitting above the $18-mark again. The online trading and bartering platform based in Canada, Bunz Trading Zone is planning to launch its own cryptocurrency called BTZ (pronounced “bits”). The firm states that it will be the first company to launch a Canadian cryptocurrency to an established community, i.e., its own members.